Cynthia S. Searcy is Assistant Dean for Academic Programs and an Assistant Professor of Public Management and Policy, specializing in financial management and budgeting, education policy, and health policy. Prior to joining AYSPS, Dr. Searcy was a research associate for the Center for Policy Research and doctoral candidate of public administration at the Maxwell School of Citizenship and Public Affairs at Syracuse University. 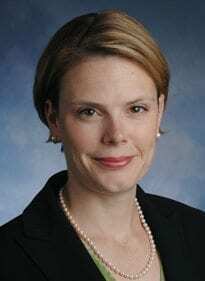 She holds an MPA in policy from the Wagner School of Public Service at NYU. Dr. Searcy’s recent research investigates the financial health and financial management practices of charter schools and U.S. cities. She also has explored responses of SCHIP participants to program co-payments. Dr. Searcy’s dissertation explored the relationships between school policies and practices and adolescent obesity in the United States. This research is embedded in a larger interest in education policy and resources available for schools in distressed urban districts. Dr. Searcy’s interest in budgeting and financial management stems from four years as a research associate at the Citizens Budget Commission, a fiscal watchdog group based in New York City. Her research can be found in the Municipal Finance Journal, Journal of Public Budgeting, Accounting & Financial Management, the Journal of Public Budgeting & Finance, and in the American Journal of Evaluation.